Nestled in the heart of The Alleghenies is Mount Assisi's Limestone Castle, It is located in the charming Sunken Gardens. 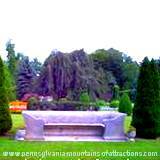 This Pennsylvania Historical site dates back over 200 years. 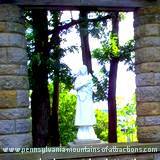 Take a stroll through The Mount Assisi Gardens anytime of the year and you will quickly realize why it is also known as, "The Unknown Jewel of The Alleghenies". No matter how you feel when you arrive you will leave feeling refreshed and spiritual. 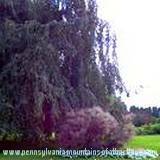 The small, historic community of Loretto, Pennsylvania, was founded in 1799 as a Pennsylvania Catholic Colony, by Father Demetrius Augustine Gallitzin. 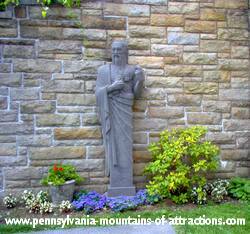 This strong religious heritage continues on today, through work of nearby St. Francis College and the Allegheny Mountains Mount Assisi Monastery. The Monastery was originally constructed as the summer estate for Millionaire Industrialist, Charles M. Schwab, the so-called "Bethlehem Steel Magnet". The estate at that time was known as a Immergrun, which in German meaning, "always green." The construction of Immergrun was complete in 1919. The estate consisted of 18 buildings scattered over 990 acres. Mr. Schwab employed over 70 people full-time to maintain the estate. Charles Schwab originally built a 15-room house for his mother in 1889 in the hills of Loretto, PA. In 1914 Mr. Schwab built his own magnificent summer home on the same Pennsylvania Historical Site occupied by his mother's home. Rather than demolish this building, crews jacked it up some 37 feet onto a track and rolled it 1,500 feet over the tops of orchard trees.. Once this estate was completed in 1919 the cost was over $3 million. The estate consisted of a 44-room mansion built of Indiana limestone, 17 other buildings, special-purpose farms, and elaborate water tower, vegetable and flower greenhouse complexes, riding stables, a 9 hole golf course and elaborate gardens on over 1,000 acres. Mr. Schwab provided the community of Loretto, PA,with a new reservoir, installed electrical power line, and paved many of the communities roads. His estate was also a major source of employment for the people of Loretto. Due to the stock market crash in 1929, Mr. Schwab lost nearly all of his fortune, including Immergrun. In 1936 attempts were made to sell the property. It wasn't until 1942, that the Franciscan Friears of the Third Order Regular tried to purchase the estate. 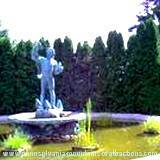 "The Friends of St. Francis", was formed in the summer of 1942, and purchased approximately 250 acres of Immergrun. It was made possible by the Community of St. Francis College. The Franciscan Friars of the T.O.R. now occupy the largest amount of acreage housing 12 buildings of the former estate. 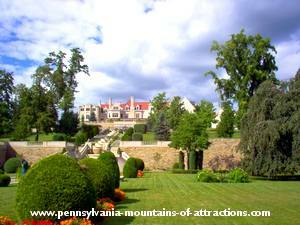 The estate is now known as The Alleghenies Mount Assisi Sunken Gardens. A century ago, the formal Sunken Gardens of this Pennsylvania Historical Site were considered to be among the most beautiful in the country. Many changes have been made on the grounds of the former Schwab estate. 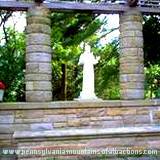 The Franciscans opened the The Alleghenies Mount Assisi Sunken Gardens to the public, and with the addition of the Fatima Shrine in 1950, have welcomed visitors to the gardens between dawn to dusk. All visitors are restricted to the gardens only. All other buildings and grounds are occupied and not open to the public. 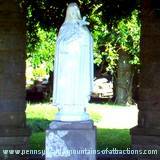 Discover Pennsylvania Allegheny Mountains Our Lady of Fatima and read how the Allegheny Mountains honor Our Lady of Fatima.